Did you know that orthodontic care dates back many centuries? The Ancient Egyptians, Romans and more all had methods for straightening the teeth. Some methods worked, while others were just downright painful. In modern times, braces design in orthodontia has been perfected. Each part of the braces is important and plays a role in straightening the teeth. Find out how braces came to be and why they are designed a specific way to get your teeth straight in as little time as possible! Braces design and orthodontic work itself has been around for many centuries; it’s not just something that we enjoy today! In fact, researchers have found that the Ancient Greeks, Etruscans, and the Romans were all some of the cultures that practiced orthodontia. However, their methods were vastly different than the methods used today. For example, in all of these cultures, braces design was different than the brackets and wires we know and love. The ancient Egyptians, however, did use metal bands around their teeth. These metal bands were found on mummified bodies, showing that even in death people valued the aesthetics of a straighter smile. Ancient philosophers and physicians had to guess at how best to straighten the teeth. Some physicians forcefully pulled the teeth with crude tools until they were straight. In some of these cases, the resulting loose tooth had to be strapped to an adjacent tooth in order to heal into place. Methods such as these were just downright painful! In later centuries, more and more philosophers and physicians experimented with better braces design. Europeans in the 17th and 18th centuries began using wax molds to make impressions of the teeth. Some also found plaster to be useful in making models of the teeth. Models allowed physicians to view the teeth in their crooked state and then plan how they wanted the teeth to eventually look. Pierre Fauchard is considered the “Father of Dentistry”. He created strips of metal that had spaced holes that fit around the teeth. This is a baseline design of the brackets and wires braces design that is used today to fix tooth alignment. Even though Fauchard made some worthy orthodontic advancements, Edward Hartley Angle is actually the one considered to be the “Father of Modern Orthodontics.” He made a very effective braces design and also identified malocclusion (or misalignment) and how to correct it properly. Eventually in the 1970s, orthodontists were sticking to the braces design of attaching brackets to the teeth and fitting an archwire around both the upper and lower jaws. In eras past, braces design was done according to the needs of adults. Children did not commonly receive orthodontic care, whereas in modern times they do. Early orthodontic care for children is needed to correct bite and alignment issues that can become severe later in adolescence and especially in adulthood. Once a child has this early orthodontic care, they will later receive braces once more to straighten the permanent teeth as they come in. Many people, therefore, have braces twice in their life if they choose to have orthodontic care. In modern times, around 4.5 million people each year wear braces. Traditional metal braces are the most popular option available to patients, and are the most effective at straightening the teeth. However, technology also allows patients to choose lingual braces, ceramic braces and Invisalign transparent aligners. Lingual braces are metal and are attached to the inside of the teeth (tongue-side). Clear, ceramic braces are made from ceramic material and mimic the same design as traditional metal braces. However, they help decrease demineralization and their white material blends into the color white of the teeth. Invisalign is a system of transparent aligners that a patient can switch out every 1-2 weeks. The most aesthetically pleasing option, it also allows patients to remove the aligners for normal brushing, eating, cleaning, and more. Bands – Patients will have a thin ring fitted to their back molars when receiving braces. This ring is typically made of stainless steel and is used to secure other orthodontic attachments, such as hooks, brackets, or tubes. Brackets – A bracket can either be bonded to the tooth using a tooth-colored cement or it can be attached to a band. They are usually made of stainless steel or clear ceramic depending on the type of braces design you choose. They guide and support the archwire into the appropriate placement. Archwire – This is held by brackets or other orthodontic attachments. The archwire is designed to guide the shifting of the teeth during treatment. These wires are traditionally made from stainless steel, but can also be made of titanium. 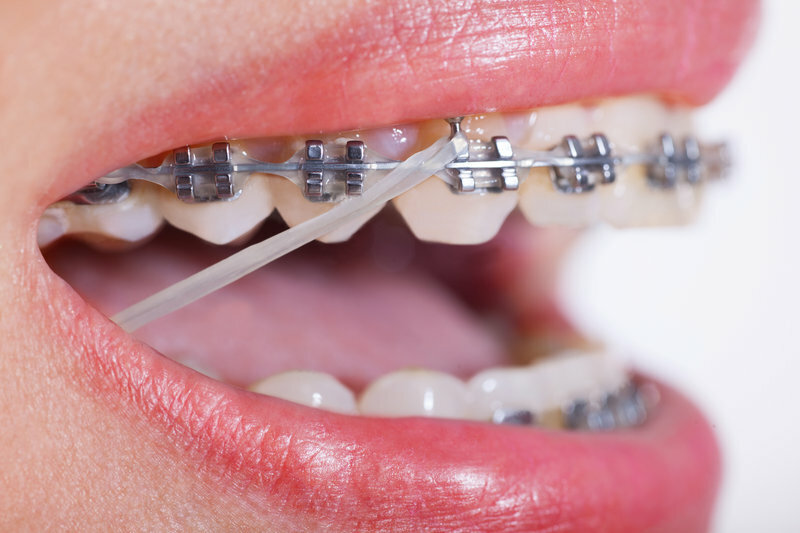 Elastics (rubber bands) – These rubber bands help create a force to move the teeth in a particular direction. These are especially helpful for pulling down or pushing very crooked teeth into place. The elastics are often attached to a molar band and upper ball hook. Elastic Ties – Elastic ties are small rubber bands that go over the brackets. These hold the archwire in place. They are available in a variety of colors that patients can switch out every time they come in for a check-up. Springs – Using the force of a small spring, a space can be opened or closed between the teeth. These springs go between brackets and around the archwire. They are usually made out of stainless steel or titanium. Braces are an amazing way to straighten your smile. Braces design has been perfected to get your teeth straight in no time. To get fitted for your set of braces, call Belmar Orthodontics today at (303) 225-9016.